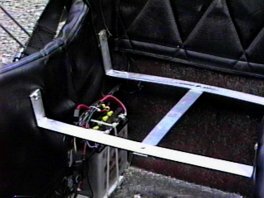 Just look at all that wasted space under the rear seat of the SR7. Why not use some of that space taken up by the foot thick piece of foam. 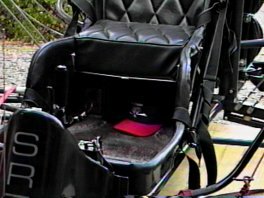 The space can be used to store your line socks, chute bag, tool kit, as well as a place to install your battery system. Turning this wasted space into a useful storage area is easy. Here's how I did it. First I should point out that I used hardware store quality materials for this project because I believe it's strength is sufficient for this project. Aircraft grade hardware could be used as well. The first thing to do is shorten the seat cushion. Since the seat cushion is enclosed in a vinyl cover, and secured on three sides by velcro, I decided to cut the vinyl only across the non velcro side. This would make restoring the seat cushion to it's original condition relatively easy. Just remove the vinyl cover from the seat foam then cut across the non velcro side with a scissors. Using a felt tip marker, mark the foam for cutting so that the edges of the vinyl will hang over about one inch to allow room for attaching it to a plywood base plate. A long blade serrated kitchen knife makes a great saw for cutting the foam. Cut the foam then insert it into the vinyl cover. Cut a piece of 1/4" plywood as a seat base using the excess foam as a template, making the plywood cutout a little smaller than the foam. 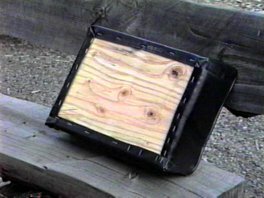 Use a staple gun, or upholstery tacks to attach the seat cover to the plywood base. The seat support is made from 1/8" X 1" aluminum bar stock. See image for dimensions. Because the molded fiberglass seat pans can very slightly in size, you may need to adjust the dimensions to fit your particular seat pan. The seat support is riveted together with 3/16" pop rivets, and mounted to the fiberglass seat pan with 1/4" X 20 X 1/2" round head machine screws, fender washers, and nylock nuts. Once you have your new seat in place, you'll need to be careful that it doesn't become dislodged in flight or while transporting your machine. In flight without a passenger, I buckle the rear seat belt across the cushion. During open trailer transport I put a bungi cord over both the front and rear seat cushions.